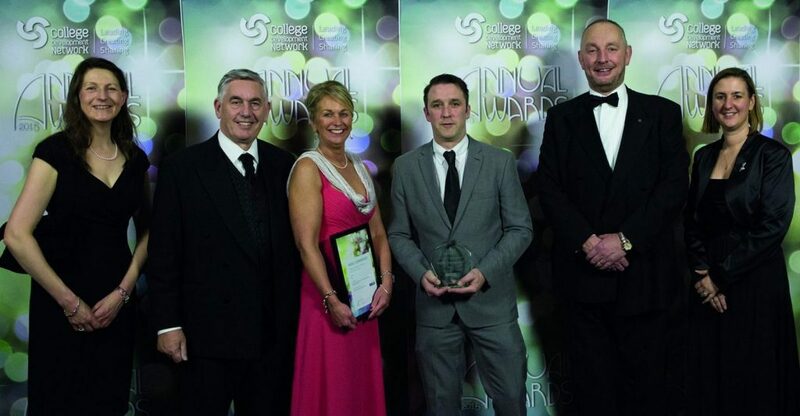 Scotland’s Rural College’s (SRUC) Barony Campus, Dumfries and Galloway E-Learning Team was recognised as ‘highly commended’ for the Learning and Teaching award at the prestigious College Development Network Annual Awards last week. The team created a new online tool specifically for HNC Equine Studies students, which was successfully implemented during the last academic year (2014/15) at both the Barony Campuses in Dumfries and Galloway and the Oatridge Campus in West Lothian. It replaced a complex paper based assessment process. The national awards were hosted by BBC’s Reporting Scotland News presenter Sally Magnusson at Glasgow’s Grand Central Hotel. The event was a celebration of the outstanding projects and initiatives taking place in colleges across Scotland and recognised the talent, skills and achievements of the staff and learners. SRUC came in a very close second, of a shortlisted final three colleges for the ‘Learning and Teaching Award’ which recognises the implementation of creative ideas to improve the quality and effectiveness of learning, teaching and assessment. The E-Learning team at the Barony Campus created an innovative new approach using the existing and popular online platforms of Moodle and Mahara, to support students in collecting evidence of their work and collating into an online portfolio. The approach has seen a 41% increase of the HND students passing their own practical element and has also increased the HNC students overall A-Grades for the HNC practical element. SRUC’s Assistant Principal of Further Education David James attended the awards ceremony and commented: “It has been an absolute pleasure to attend the Awards Ceremony. It is a fantastic achievement to reach the finals of a national competition which is open to all colleges across Scotland. SRUC Oatridge student Nyree Dickson, 21 from Renfrew, used Mahara to produce her entire portfolio required for her HNC last year. Now studying for her HND, Nyree commented: “Mahara helped me so much while I was completing my graded unit and it helped me enjoy working on it. The structure was easy to use once it was explained. SRUC Barony’s E-Learning Developer Ali Hastie led the project and commented: “My colleagues and I are overwhelmed that the project was runner up at the prestigious College Development Network Annual Awards. This is recognition of the project team’s hard work, dedication and passion in improving the teaching and learning experience for our students. We are extremely proud to have particular interest from SQA who wish to use the Equine Graded Unit project’s model and framework within Scotland’s education sector. At the Awards ceremony SRUC received a second acknowledgment as Highly Commended under the category of the ‘Sustainability Award’ which recognises having taken an imaginative approach to tackling sustainability issues and improving its green credentials. Photograph L-R: Acting Chief Executive SRUC Janet Swadling, Brian Keegan, Tribal (event sponsors), SRUC Barony Tutor Jackie Irving, SRUC E-Learning Developer Ali Hastie, SRUC Assistant Principal of FE David James, SRUC Head of Animal & Equine Department Karen Martyniuk.